The word Taurus is derived from the Greek word 'Taurus', which means a Bull. In Sanskrit, it is called वृषभ (Vrishabha). It represents procreation and power. The ancient seers considered a bull to be a representation of this sign. Being immensely physically well built, they have an enormous competence to breed its stock. In this form, it is a storehouse of the procreative energy. Those born in the Taurus ascendant are respectful to elders, soft-spoken, well-mannered, energetic and active, wealthy, money-oriented, audacious and overall liked. It is considered to be one of the luckiest sign out of all 12 signs. Taurus represents materialistic growth. A person born under this sign has an armory of soft speech, well-mannered behavior, competence for tackling adverse conditions and tactful opponents. They don’t show their cards until they have achieved their targetted objective. They are always keen to learn different skills or upgrade them for an economically sound future. Showing respect to elders and experts is one of the factors for their materialistic growth. Through a set of good manners and by giving proper respect to the elders, one can achieve longevity in lifespan, skills, fame and power. Risk is an integral part of any entrepreneur’s story. One may not hope for some growth without undertaking any risk. Taureans are proficient in managing risks and establish stability in life. Excess of everything is bad. Taureans have a preoccupation for material assets, especially luxury goods and wealth, and equates them with happiness and fulfillment. Sometimes, this excess obsession for materialistic wealth breeds unhappiness. For removing such type of thoughts, one should wear a good quality Blue sapphire. It would enhance the humanitarian side of the wearer. For achieving growth, Taureans can change their statement as rolling stone. They have the quality of changing the meaning of the statement without changing a word. This drawback of dualism can be rectified by using a Blue sapphire, worn in the middle finger. Taureans are extremely goal-oriented that they often form a belief that the humankind revolves around them. Their self-indulgent streak makes them offensive, and ignorant of others’ emotions. In this case, an emerald can be the perfect solution as it would make the native sensible, realistic and responsible. 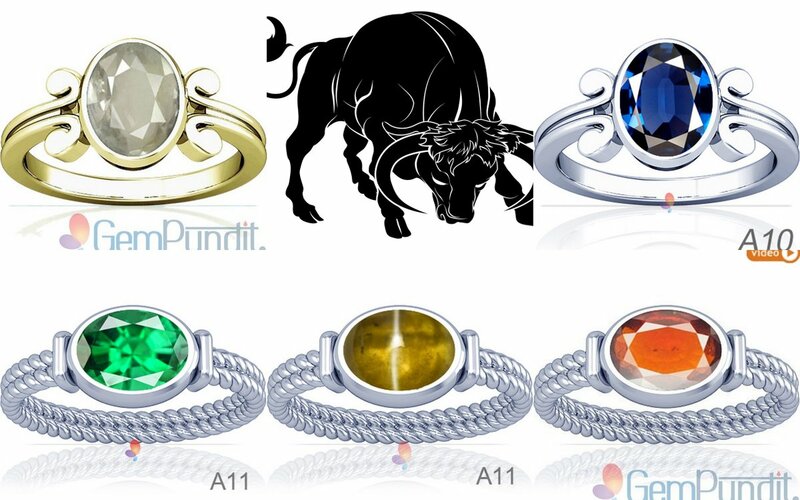 How Would A Gemstone Help A Taurus Born Native? • Ascendant lord, Venus carries an important portfolio here. It represents physique, appearance, and respect. So, by wearing a white sapphire, one can enhance these traits in his/her life. • Venus is a sole karaka of Romance, creativity, and arts. So, this gemstone would help the wearer in his/her married life. • Saturn holds a vital position in the lives of the Taurus-born natives. It stands for good luck, foreign travel and religion. So, with the help of a blue sapphire, wearer stands a chance to attain good fortune. • Blue sapphire is a stone for mass support and professional growth for people born under the bull sign. • Some of the important aspects of the life like education, learning, knowledge, progeny and expertise in some skill, life are ruled by the sole planet Mercury. Emerald will help the wearer in achieving success in these parameters. • Finance and vocal abilities of people having birth under the second sign of zodiac can be improved by wearing this green astrological gemstone. Hessonite & Cat’s eye can also be useful in some special cases.